I was introduced to the Alexander Technique in 2004 after having suffered from niggling lower back and hip pain for a number of years. I was never sure what caused it but it was annoying and over the years I spent a small fortune on physiotherapists, chiropractors and acupuncture. All of these made me feel better but only for a limited amount of time. The pain always returned and I was very aware of the fact that these therapists were treating the symptoms of my back pain and not the cause. In fact, not one of them was able to give me a satisfactory answer when I asked them what was causing my back pain! I therefore decided to try and find something that would identify the cause of my back pain and thus allow me to change things in order to eliminate it. At the time I was working as a classical music producer for BBC Radio 3 in Glasgow and I remembered that a colleague from many years earlier, when I had been working in London, had trained to be an Alexander Technique Teacher and I vaguely knew that it was all about trying to improve the way you used your body. I talked to her, she recommended me a teacher in Falkirk and I went along for my first Alexander lesson. I didn't really know much about it and didn't really know what to expect but I went away from that lesson feeling much better. After fortnightly lessons my back and hip pain was much improved. Some years later I was given the chance to take voluntary redundancy from my post at the BBC and I grabbed the opportunity with both hands. It enabled me to enrol on a full-time training to course to learn to be a Teacher of the Alexander Technique. I studied at Cumbria Alexander Training in Kendal and completed my training in December 2014. I am passionate about the benefits of the Alexander Technique and I am working to bring it to a wider public. I am also one of the teachers on the AT teacher training course at the Edinburgh Alexander Training School. Find out more at www.edinburghalexandertraining.com. 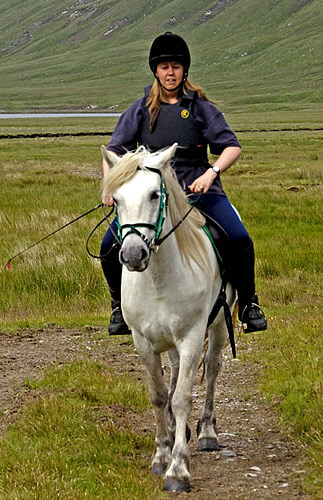 In my spare time I like to sing, ride my highland ponies, go on long walks in the hills and explore the world. I am particularly keen to teach Alexander Technique to people who are interested in any of these activities.